Soccer is strenuous and requires a lot of physical stamina, and proper hydration will reduce your risk of injury as well as help you maintain peak fitness levels after the match. 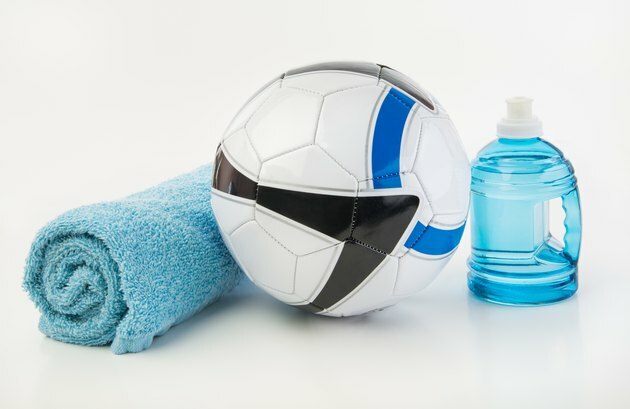 You need to consume more water and fluids than normal while playing soccer -- or any other sport -- to make up for lost fluids due to perspiration, helping you stay focused and in peak physical shape. The amount of water you lose during exercise depends on the degree of intensity as well as the weather. If you are playing soccer in hot weather, you will need to consume more fluids. The American Council on Exercise states that one hour of exercise can lead to more than a quart of water being lost. Drink water throughout the match, regardless of whether you feel like you need it or not. The Gatorade Sports Science Institute recommends that you drink enough fluids so that your body weight at the end of any match -- a light training exercise or a more intensive game -- is within 2.2 pounds of your starting body weight. Proper hydration begins 24 hours before the start of the match. The majority of your intake needs to be from drinks, roughly 80 percent, with the remainder of your fluid intake coming from foods. MedlinePlus recommends a minimum of six to eight 8-ounce glasses of fluids each day given average temperatures, humidity and physical exercise. The American Council on Exercise suggests drinking 17 to 20 ounces of water two to three hours before the start of the match and 7 to 10 ounces every 10 to 20 minutes of the game. Afterward, drink 8 ounces of fluid. You can hydrate with a variety of fluids -- including tea, juice or soda -- although water is considered optimal. The American Council on Exercise recommends water as the best choice, although drinks that contain electrolytes are recommended if you are engaging in strenuous exercise for a minimum of 45 to 60 minutes. Electrolytes are minerals that are found in your blood and body fluids, and they affect how much water is in your body, as well as your muscle function. Water does not contain electrolytes; drink sports drinks or coconut water, each of which contains electrolytes, to replenish your supply. In general, rehydration is faster when there is some sodium in the drink. If you do not stay well-hydrated, you run the risk of dehydration. A study published in the "British Journal of Sports Medicine" in 2007 found that even moderate dehydration led to a significant decrease in fitness performance levels as measured after a 45-minute match. When you start feeling thirsty, your body is already mildly dehydrated, which is why you need to drink fluids regularly and not only when you feel thirst. Signs of dehydration include a dry mouth, less urination, dark-colored urine, a headache and muscle cramps. Mild dehydration can often be self-treated by drinking water or a sports drink, as well as sucking on ice cubes, while severe dehydration needs to be treated with professional medical care. Treat dehydration as soon as you recognize the symptoms. Stop Sports Injuries: What Are Common Soccer Injuries? Gatorade Sports Science Institute: Creatine, Carbs and Fluids - How Important in Soccer Nutrition?